The PK-A Military Fast Acquisition Red Dot Rifle Scope, AK Version is an outstanding red dot scope that is comparable to Western versions selling for many times more. It is a current issue tactical military scope. It is perfectly suited to semi-automatic and automatic weapons and is great for high density urban suppression and for picking up fast moving targets. Designed to stand up to the toughest battlefield conditions, you can take it anywhere. It has a super-wide 40 degree field of view that lets you survey and track the complete field of activity. 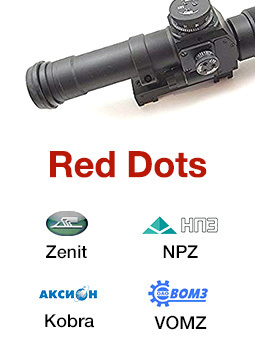 This red dot will significantly improve your aim in dusk conditions. It boasts a bright 1 MOA Red Dot to give you very precise and accurate aiming. It has a special 8 setting, discreet built-in variable brightness control allowing you to regulate the brightness of the dot manually. It is overbuilt to handle the strongest of recoils and can be attached to any weapon regardless of caliber. It is compact, lightweight, waterproof and dry nitrogen purged to prevent fogging. 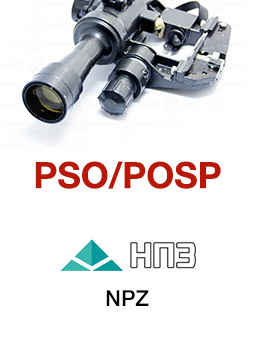 Perfectly suited to use with night vision optics such as goggles, it is a scope for all events. 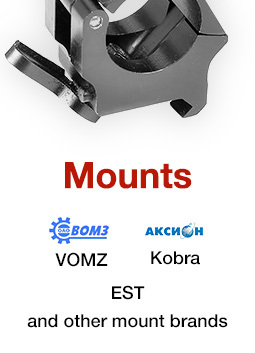 The open windage and elevation knobs are easily accessible for adjustment and have clear, pronounced clicks. 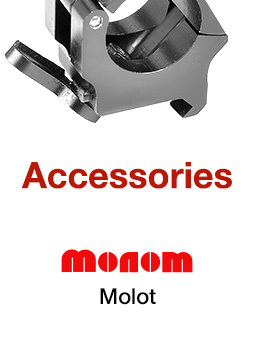 Russian sights are particularly popular for having open uncovered knobs that are finger adjustable. It comes with a full set of accessories including a detachable metal shade, a lens cap and a soft carrying case. It comes with a built-in mount for AK, Siaga and Tigr rifles and all of their variants including all foreign versions. It can not be mounted on a Western rifle without first putting a mounting plate on the rifle. It is a definite BEST CHOICE! Batteries for this scope can be found at the bottom of this page or in the Batteries and Bulbs section.